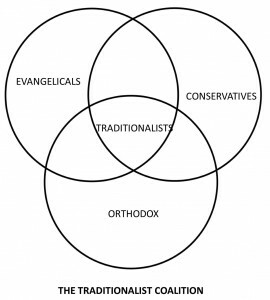 The traditionalist coalition that formed a majority at General Conference last week, and against which so much fury is now being vented by bishops and other progressive/centrist church leaders, is made up of three overlapping groups: the Evangelicals, the Conservatives, and the Orthodox. In this part of my series on “Understanding the Traditionalist Coalition,” we take up the last of the three groups, the Orthodox. I should point out that “Orthodox” is a loaded term. My Eastern Orthodox friends don’t like it when I refer to anybody but them by that name. Even if I say, “small-o orthodox,” they say there is no such thing. Unfortunately, orthodox, like catholic, and even evangelical, has become a faction word in the Christian world. Still, we need a term to describe these folks. One colleague refers to us as “creedal/confessional,” which is okay, but I think overlooks the historical aspects of orthodoxy. Anyway, this has a personal aspect to it, so if you’ll indulge me, I’ll tell you a little about my early days in the ministry. I attended Asbury Theological Seminary in the 1970s, but I didn’t come from a traditional evangelical or holiness background. I came in out of nowhere, a church orphan. And I came prepared to soak it all in, but I found it hard to do. I kept getting zinged by my fellow students. I was all head and no heart, they said. Meanwhile, every time I turned around, I was hearing one more story ending with somebody’s trip to the altar that involved leaving behind a puddle of tears. Apparently, shedding tears indicated the reality of the spiritual transaction that had occurred there. I graduated and was ordained. As a pastor attending Conference, I noticed that the Evangelicals all clubbed together and did spiritual things like morning devotions. I went a few times, but I never felt particularly welcomed. When I did speak to my colleagues, I got the same zingers I got in seminary. I didn’t come across as spiritually authentic, I guess; I spoke the language, but apparently I had an accent. One of my Evangelical colleagues – a friend, I point out – said to me once, “Well, Art, you’re one of the most liberal members of the Conference, aren’t you?” To say I was shocked is an understatement. The Evangelicals had closed themselves off from everyone else, raised the bars, and were trying to bring renewal to the church by holding revivals off in a corner. They figured that when everyone else got religion, we would join them there, I guess. And doctrine – which we all had to learn in seminary – was taboo. Not spiritual. I wanted to talk about metaphysics and church history. That was all intellectualism, no heart. I didn’t know what to say. I let them do their thing, and I went off to do mine. Those were the days when most of the liberals were debating nuclear freezes and how to save the whales. They weren’t interested in doctrine, either. Sometimes, I thought I was the only one who still taught the creeds. I’m sure I wasn’t, but it was an anti-intellectual age. That changed, eventually. In the early 1990s, after yet another General Conference that pressed for liberalizing all kinds of things, a little group formed in Indiana, with a cumbersome name I don’t recall. I figured it was another Evangelical rodeo, but I went because I was concerned, too, about the direction of The UMC. It felt different. Soon, it joined up with other groups and became a national organization. It called itself the Confessing Movement within The United Methodist Church. The Confessing Movement was a new thing. At its core were still many of the Evangelical leaders, but now they were finally addressing the doctrinal challenge within the church. And there were many seminary professors involved. Some of the key teaching leaders then and since have included Thomas Oden, Billy Abraham, Bill Arnold, and David Watson. Instead of leading with a feeling and an experience, they led with dogma: Jesus Christ – Son, Savior, Lord. At GC 2016, we debated including the Nicene Creed among our official doctrinal standards. We’ve come a long way. I think the formation of the Confessing Movement was a hinge moment. The Evangelicals realized they needed to broaden their appeal. And they realized the challenge wasn’t spirituality, it was doctrine. At the same time, the advancing and accelerating progressivism of The UMC was alarming other people who had previously written off the doings at General Conference: the Conservatives and the Orthodox. By making a place for all of us, we were stronger. And by focusing on doctrine, they brought to the fore the gifts of those who had never fit within the evangelical subculture. Meanwhile, the Evangelicals had also been creating workarounds to pursue their interest in missions, and when the time was right, we began to see contacts between the American renewal leaders and frontline leaders in Africa and other places. Which brings us to today. But I digress. I wanted to talk about the Orthodox. There are more of us than you might think. We are clergy and laity who either didn’t fit in with the evangelical subculture or who came at things differently from Evangelical theologians. We are, indeed, interested in creeds and confessions, but also the history of the Church. And not only the Church: remember, we are children of Abraham. To the 2,000 years of Christian history, you have to add about 1,800 more years since God revealed himself to Abraham and the central tradition that tells of our relationship with the God of the Bible began. I can’t speak for everybody else who might consider themselves merely orthodox, but I don’t see the Bible and Tradition as separate categories, which is a prominent feature of Evangelical theology. I see the Bible as the chief part of the Tradition, the part that does not change. As such, it acts as a tuning fork for everything else. We know we are in tune with the whole instrument upon which God plays his music when we are in tune with the Bible. But the Bible isn’t separate from the Tradition. A holy book presumes a community to receive and read the book. It presumes language. It presumes culture. It presumes religion. The Bible isn’t a sacramentary, let alone a handbook on church polity. It’s a story, mostly. The story. Our story, or the key part of it. Leading out from that story is the story of the People of God from Abraham to our day. We need to understand OT religion and culture. We need to understand Second Temple Judaism. We need to understand the world of the early Church. We need to grapple with the controversies that were addressed in the great Councils. We need to see the missions thrust in what we carelessly call the Dark Ages. And, yes, we need to address the Reformation and the Enlightenment, and the Frontier Awakening, and all that. If what we say is true, then the story of the People of God will show a likeness in all times and places. The central pattern will be easily discerned. And this has practical consequences for the teaching of the church today. For one thing, if what we say about the Communion of Saints is true, then Athanasius and Augustine and Cuthbert and Wesley are still on the Board of Ordained Ministry: you can disagree with them in particulars (they wouldn’t all agree with each other on everything), but you can’t just say they’re dead and gone and we don’t need to wrestle with their objections to what we want to focus on. For another thing, once you see the central pattern repeated over and over in place after place, age after age, it becomes apparent how much of an innovation the progressives are offering. It’s not attached to anything. It just comes out of today’s itch. The Orthodox are the people who want to present the riches of all times and places to the People of God today. They come from different subcultures within the whole Church, but they are trying to reach beyond personal and group limitations to find what is given to all of us, all the time. Some are also Evangelical, but others aren’t. Some are also Conservatives, others aren’t. But all of them are convinced of the truth of the Gospel and can defend the Great Tradition as we find it in the Bible, the Creeds, and the lives of the Saints. To Good News and its offshoots and the IRD and the Confessing Movement, we now have to add the Wesleyan Covenant Association. The WCA includes all the different sorts of people I’ve been writing about that are within the traditionalist coalition, but they are focused differently. Good News is about sharing the experience of the Gospel. IRD addresses the culture we live in. The Confessing Movement agitates for theological renewal. The WCA is trying to imagine the Next Methodism. If the progressives finally manage to seize control of the Church, then there will be no place for traditionalists in it, and a new Methodism will have to be created. If the traditionalists finally catch the car they’ve been chasing, then we’re going to have to do something to rebuild the old Methodism so it works again. WCA is trying to figure out how to do that. And beyond these organized aspects of the coalition, there are many, many ordinary people in their local churches who have no time for this kind of activism. But they are the saints who do the praying, the giving, the loving, and the caretaking that moves the Church, and therefore, the world. And over and over, they come up to me and to many others, when they know we’re doing what we do, and they thank us, repeatedly. It matters to them, too. Finally, I haven't said much about the emerging partnership between Evangelicals in Africa, the Philippines, and Eurasia and the Evangelicals, Conservatives, and Orthodox in America. That's because I don't know as much about their struggles as I do the struggles of American United Methodists. I suppose I know more about Africa (and I know more African UMs) than about the other Central Conference UMs. I know, though, that they are not monolithic. There are differences of opinion on all the matters before us in those places, just as there are here. They argue among themselves, I'm sure, just like we do here. But the fire of the faith is burning hot in those places, and the church is growing like wildfire. Their style is largely Evangelical, so we tend to associate them with that component of the traditionalist coalition. But that's just "church" for them; meanwhile, some of the teachers I've met over there are just as much part of the Orthodox wing of the church as anybody else. In any case, the success of the traditionalist coalition would be unimaginable without them. They aren't just the margin of our victory, they are the victory. They provided at least half of the total traditionalist vote at GC'19. And their growth means there will be more of them next year at GC'20. We have great hope for this relationship. There's a challenge there, for they care about other things, too. Right now, we're all united on doctrine and morals. But as we start talking about what the Next Methodism should be, we have to remember that the center of gravity of that Methodism is shifting toward them. They have to be full partners in that discussion, and their hopes and fears will have to be addressed. So, that’s who the traditionalist coalition is.